This classic Telluride home is only one block from Lift 7 and Clark’s Market and only half a block from the town shuttle route. The kitchen is newly remodeled with nice hardwood flooring throughout. 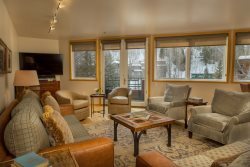 Cozy up to the fireplace after a long day of skiing and enjoy the covered deck with a private BBQ Grill during the warm summer months and snowy winter days. We rent house on all our ski vacations. I really have to say Latitude 38 was the most enjoyable. We were always up to date on everything for our visit. Was offered early check in, with out asking. Latitude 38 could not have been more accommodating. Thank you for making our vacation stress free. I love using this service. I have used it 3 years in a row. I will use it again when I inevitably return to Telluride. I was happy to find a place for myself and 7 friends for the Mountainfilm Festival. It was wonderful to come home to a comfortable bed, hot shower and a kitchen with all the amenities after a long day of watching films. Everything about this house was cozy, clean and bright. I would definitely recommend staying here if you are a family or just a few friends trying to get away for the weekend. They left plenty of information about what to do in town and provide extra services if you need something while you are in town. The parking on the street is free and the grocery store is literally a stones throw away, which was a huge plus! The door has keyless entry so you won't have to worry about losing any keys and can feel confident that it will be locked even if you have a few people in and out. Shampoo, Conditioner, Body Wash, Hand soap, Lotion, towels, and toilet paper were all included. The kitchen was well stocked with spices, oils and the basics to get you started. They were very pleasant to speak to and we felt very much at home!